Hot enough for you, Carol? Hello Dr. Hortfreud! I didn’t expect to see you today since I’m staying inside where it is cool. Well, there’s something I think you need to talk through so I decided to pop in for in impromptu intervention. You don’t mind, do you? Carol, I’ll get right to it. I’ve noticed you’ve got a little flat of Sedum ternatum growing on your patio. Oh, yes. Do you like that? I got a little pot of it from a local nursery and decided to go all retro and root some cuttings of it to make it go further. Why is that retro, Carol? Never mind the answer, we’ll talk about that later. What I wanted to point out is how much the Sedum ternatum looks like your weed nemesis, purslane, Portulaca oleracea. It does? Well, I guess it does a little bit. But really they are from two completely different plant families. Sedum is from the Crassulaceae family and purslane is from the Portulcaceae family. Any similarities have to be purely coincidental! Coincidental, Carol? Are you sure? I’m getting the idea that maybe you don’t hate purslane as much as you profess to. Are you ready to eat some of it? It is very nutritious, they say. Oh, no! I’m not going to eat any purslane. You can’t make me, even as part of my therapy! I’m going to pull it out by its roots wherever I see it growing in my garden and throw it in the trash. Well, that could take awhile. I see you once again have a lot of it growing everywhere, especially in the vegetable garden. Gosh, Dr. Hortfreud, didn’t you notice how hot it has been? Yes, I have indeed noticed the heat. But that’s no excuse not to explore these issues you have. Yes. Now, let’s get back to this sedum. Why again did you make cuttings? Because my garden designer said we would be planting groundcover plants around the honey locust in the back, and that’s a big area to cover. Look how nicely it grows at the art museum. Oh, I see. Well, maybe you could plant some purslane around the tree. You seem to have a knack for growing it. Dr. Hortfreud! Purslane is a weed. I’m going to stick with Sedum ternatum and whatever else I can find that I like to use as a groundcover. Well, Carol, I think you like purslane, but you can do as you please… as usual. Thanks, Dr. Hortfreud. I have just one question. Are you charging me for this intervention? Oh well, in that case I better switch from pulling out purslane the weed and start harvesting purslane the crop. Rumor has it that it is going for $4 a pound in the big city. Besides sedum ternatum is a native sedum that does great in shade — how many sedums can say that? 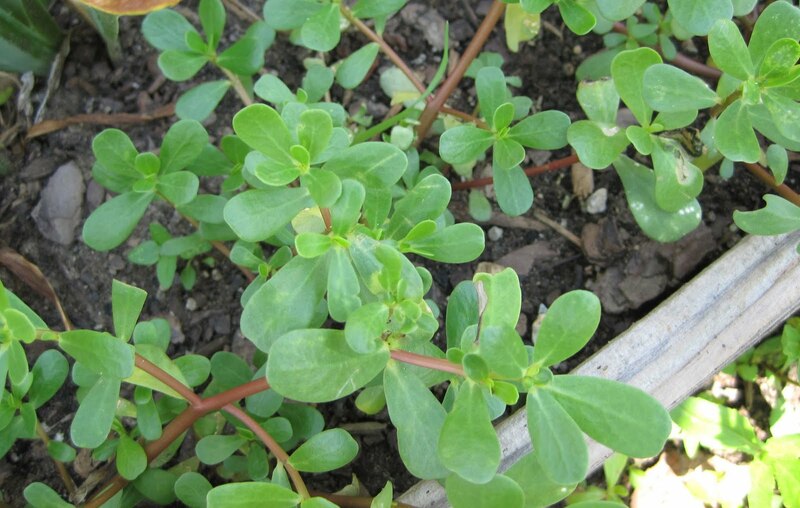 Purslane's origin in North America is unknown. 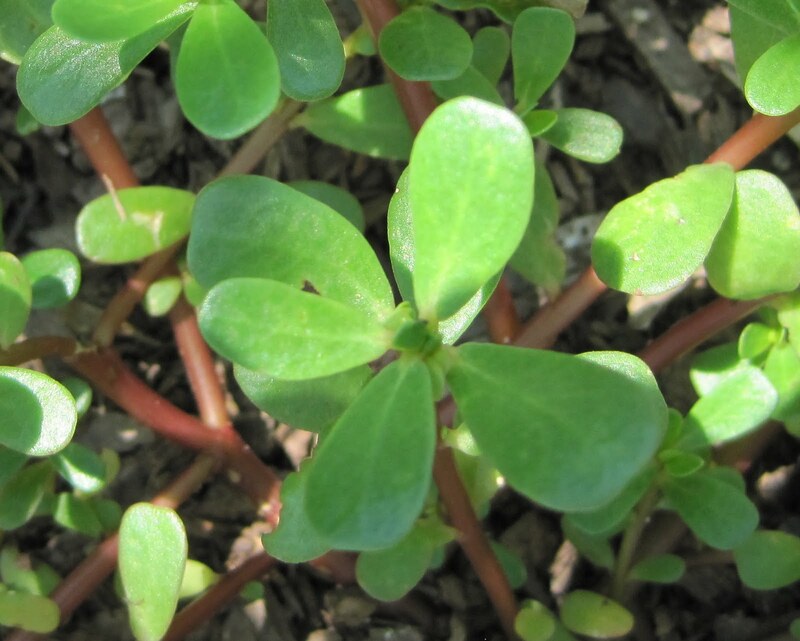 Purslane: the plant we love to hate. Right along with smart weed, pig weed, poke and my particular pet peeve Oxalis stricta, or Yellow wood sorrel or what I call the plant from h***. 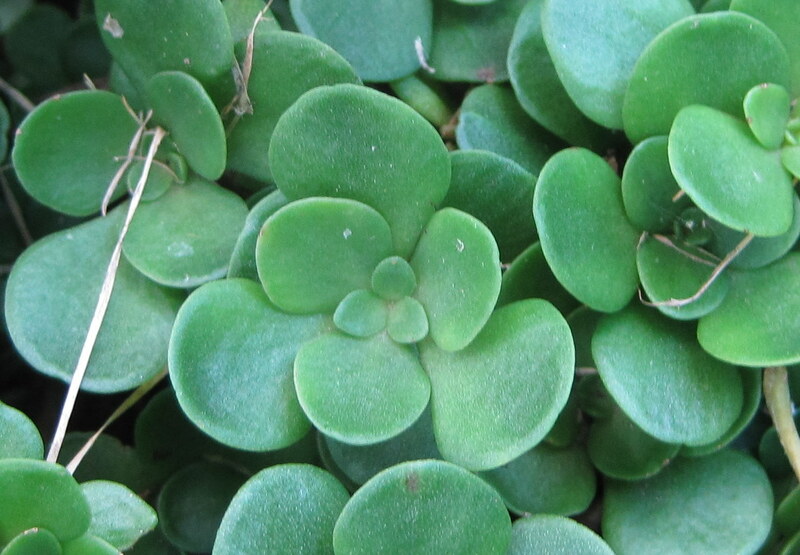 You don't have to eat the purslane, no matter what Dr. Hortfreud says. Maybe you could enlist the garden fairies to pull the purslane. Purslane... no no no. I like Healing Magic Hand's suggestion: get the garden fairies to pull it out and earn their keep. They can do it. If you cant beat them, join them-I just made been and greens soup and added some purslane from the garden. Great post I have never met Dr. Hortfreud before today and I love him and his no nonsense approach to therapy. I definitely need him in my gardening therapy sessions. Hey and if you think about it weeds can be very beautiful in fact most weeds you find in the wild are called wildflowers so from here on out whenever my garden gets a little too weed I am going to say "I'm just really into wildflowers at this stage in my gardening career. Might as well grow spurge. You go girl! I mean Dr. Hortfreud. (I've always assumed she's a woman.) I don't think you need Dr. Hortfreud to analyze the growth habit of your purslane--in the vegetable garden alongside all the other edibles. So proud of you, Carol. I see baby steps in your purslane recovery. I'm glad I'm not the only one who thinks the two look very similar. I installed some S. ternatum a few years ago, and enjoy rooting pieces of it. But when some purslane pops up next to the sedum, I have to let it grow out a bit to make sure I can properly ID it before making the pull/leave decision. Purslane IS a weed... but it is also delicious. You know, it is a good thing I don't have a Dr. Hortfreud in my life... I'd never be able to afford dealing with all my horticultural issues! Remember, a weed is a plant that is out of place, a good general definition that covers the lemon balm that I bought 28 years ago, one four inch pot, and now infests every coroner of the yard. It is a definition that includes the white violets I invited in from the yard next door and the biennial bluebell I adopted from the dying yard of an old friend. These plants produce hundreds of seeds all of these seeds are viable. Purslane is nearly as hard to weed out. I like to leave some puslane growing in selected places because in inhibits other "weeds," such as the three I just listed. After last night's rain purslane was so easy to pull. You could get a grip on one stalk and the whole plant came out roots and all. Weeding this morning was fun. At $4 a pound I made a bundle. I have to admit when I was in my herb aquisition period, I bought some golden purslane. That was 20 years and it still pops up now and then. All I know is that the good Dr would faint if heshe saw my garden right now. It has been too hot to pull weeds or anything else outside. I decided to use the red leafed "Yellow wood sorrel or what I call the plant from h***" as a ground cover in my garden. I think it goes well with my other red leaved plants. I may live to regret it, or I may not. 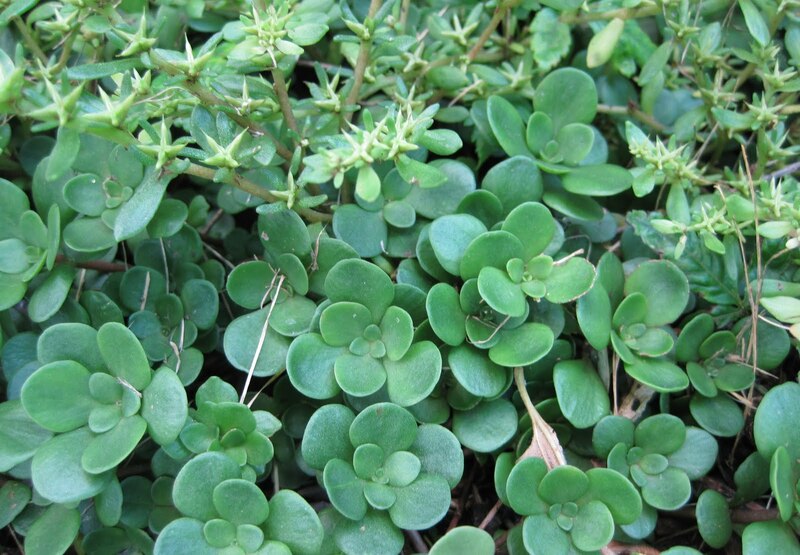 Maybe you should think about using purslane as a ground cover. If I had purslane, I'd feed it to my chickens. They would probably love it. Finding a use for something guarantees that it will disappear. Thanks for the laugh. I am in a constant battle with purslane in my vegetable garden. I sometimes take nibbles out of it when I pull it. I just put up a comment about how I have always loved to eat purslane, and a friend linked to this post. Forget Dr Hortfreud, and get Julia Hortchild on the horn! Carol you really should try eating purslane- It is yummy sauteed with garlic and onions!